SCOTLAND : Nicola Sturgeon unveils £500m business fund | Welcome to Dare Lasisi's blog! Nicola Sturgeon has unveiled a £500m fund to help Scottish businesses as she sets out her government's plans for the next year. Ms Sturgeon told MSPs at Holyrood that the move was an "exceptional response to an exceptional economic challenge". She also insisted that education was the "defining mission" of the Scottish government. A Child Poverty Bill will also be introduced, which she said was arguably its most important legislation. The bill would establish Scotland as the only part of the UK with statutory income targets on child poverty, and see a "baby box" given to every newborn. Ms Sturgeon's SNP formed a minority government after winning 63 seats in May's Scottish Parliament elections. She told MSPS that Holyrood was operating in a "new political, economic and constitutional context" following the UK voting to leave the EU. The first minister said the Scottish government would use its newly devolved powers over tax and welfare to adapt to those changes as she set out its programme for government. 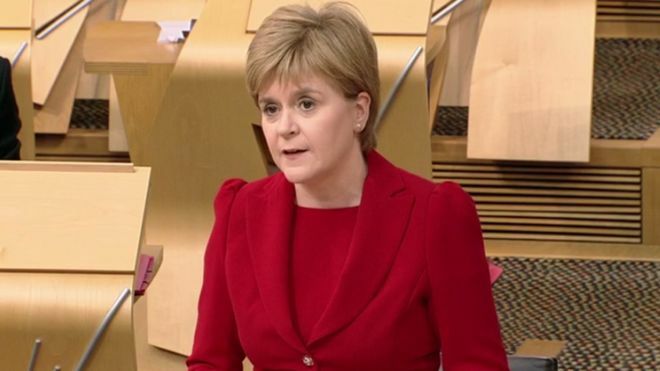 Ms Sturgeon has already ordered ministers to start drawing up legislation for a second independence referendum, which she said is "highly likely" - although not inevitable - following the Brexit vote. She told MSPs that the Scottish government would consult on the draft referendum bill in case an independence referendum was the "best or only" way to protect Scottish interests - sparking groans and laughter from opposition politicians. They have called on the Scottish government to "focus on the day job" of improving public services instead of pushing for independence. Ms Sturgeon said the £500m Scottish Growth Scheme would offer individual investment guarantees, and some loans, of up to £5m to small and medium sized firms who would otherwise be unable to grow because of a lack of investment finance. As financial guarantees, the support will not come from existing spending plans, and will instead see the Scottish government share some of the risk faced by small companies, when they make big investment decisions. The first minister described the fund as a "half-billion pound vote of confidence in Scottish business, Scottish workers and the Scottish economy". Ms Sturgeon said four of her government's bills would focus on some of the new powers that have been devolved to Scotland, with proposals to cut Air Passenger Duty, incorporate British Transport Police in Scotland into Police Scotland, and to promote gender equality on public boards. The fourth bill would set out proposals for a Scottish welfare system based on "dignity and respect", the first minister said. Ms Sturgeon said education was the "defining mission of my government", that that she was aiming for "truly transformational investment" in childcare. She added: "I have said that I want to be judged on our success in narrowing and ultimately closing the attainment gap. "We must not tolerate a situation where some children from deprived areas do less well at school than those from affluent areas. 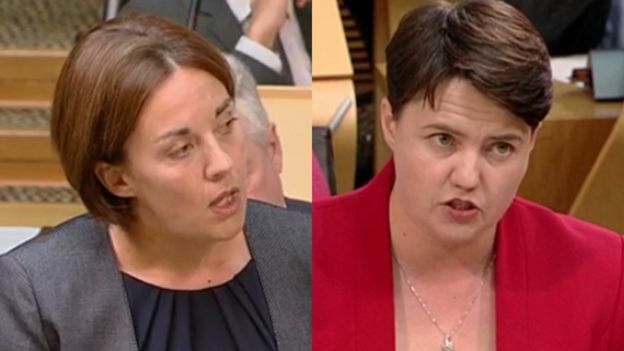 Responding to Ms Sturgeon's proposals, Scottish Conservative leader Ruth Davidson said it was time for the Scotland's government and parliament to "deal with the real and the present problems that we face". She said these included "the challenges faced by doctors in general practice, a profession that cannot right now find staff because one in four training posts is lying vacant". Ms Davidson also said the education system was still failing to give Scotland's poorest communities the "real ladder of opportunity", and that problems in the economy could "too easily lead through to fewer jobs and reduced quality of life". She added: "There is a bulging in-tray for this government to address, which requires all of its attention right now." Ms Davidson also said the "biggest economic lever" the Scottish government could pull would be to rule out an independence referendum, which she described as a "lead weight on our country's prospects". Scottish Labour leader Kezia Dugdale said the government had shown a lack of ambition, claiming that "as more powers are passed to this place, the less willing the government is to use them." Ms Dugdale said bold and radical action was needed, but that the Scottish government was only interested in passing on cuts made at Westminster rather than using its own powers to ease them. And she again said that Scottish Labour would not support any attempt to hold a second independence referendum.